Pontus Jansson and Marcus Antonsson. CAPTAIN Liam Bridcutt is again missing for Leeds United for today’s Championship hosting of Ipswich Town at Elland Road. Bridcutt - who has missed United’s last two games with a foot injury - fails to make the Whites bench, with head coach Garry Monk making one change to the team that won 2-0 at Cardiff City last weekend. That one change sees Kalvin Phillips replace Ronaldo Vieira in centre midfield. Centre-back Pontus Jansson returns to the Whites side having missed the mid-week EFL Cup win against Blackburn Rovers. Jansson partners Kyle Bartley at centre-back, with Bartley again captaining the Whites in Bridcutt’s absence. 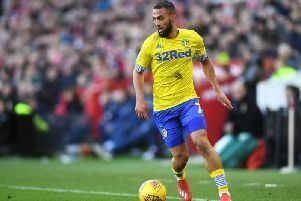 Leeds United team v Ipswich: Green, Ayling, Jansson, Bartley (c), Taylor, Phillips, O’Kane, Hernandez, Dallas, Sacko, Wood. Subs: Silvestri, Coyle, Cooper, Grimes, Mowatt, Roofe, Antonsson.